Cooked rice - whatever type you personally enjoy - this gumbo goes over the rice. In skillet make roux using bacon grease or oil and flour. Cook until it is chocolate brown color. Add chopped vegetables and stir until wilted. Transfer to a large gumbo pot (I use a large stew kettle. . .key word - large.) Add water and bring to a boil. Add seasonings, and tomato sauce. Boil for approximately 1 hour. Add crab leg sections and parsley, continue boiling for about 20 minutes. Add Shrimp, crab meat and Scallops 2-3 minutes after adding the crab leg sections. Serve over hot fluffy rice in large soup, or if you have them, gumbo bowls. 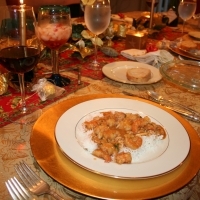 **Note: File powder comes from the south, if you are not a southerner- you may not know this, and if you have some available then sprinkle a little on top of the gumbo just before serving. I make my roux with bacon grease all the time. The only thing that I use that's different is a poblano and I add worcestershire to the roux also. I then refridgerate the roux for a week prior to using it. I also thought I was the only person on the planet that used scallops in my gumbo! Now you got me hungry for gumbo! This sounds wonderful even at 7:00 am! Thank you for sharing the recipe. I will definitely be making it. I wish you had a picture posted, I'll bet it's beautiful! This sounds wonderful. When I decide to splurge on crab I will make this. Living inland like we do in WI, we don't have access to the fresh ones quite as readily or as cheaply as those who live closer to where they are caught. Thank you for a great post. Shandy, Thanks for this recipe.We are still eating gumbo.I have frozen the rest.Have you ever done that and will it taste the same? Great effort and fab taste! Can't go wrong here! Thx!